BALTIMORE (CNS) — The church needs to do a better job of encouraging Latino families and underserved populations to send their children to Catholic schools, the bishops were told Nov. 10 during their annual fall assembly in Baltimore. “If efforts are not made to reach out to them, they won’t think it’s a viable option,” said Bishop Daniel E. Flores of Brownsville, Texas, chairman of the Committee on Cultural Diversity in the Church. He noted that for many families from Latin America, Catholic schools were so expensive in their home countries that they never even consider Catholic schools when they come to the United States. Encouraging such families “must be a priority of bishops, superintendents, pastors and principals,” said Bishop Flores, urging his brother bishops to reach out to Latino families at gatherings and neighborhood or church functions. He also said Catholic schools, despite their tuition costs, can be made affordable for those unable to pay, either through scholarships or — in states where they are available — tuition tax credits or vouchers. The outreach to Latino communities is a key part of the church’s mission to preach the Gospel, said Archbishop George J. Lucas of Omaha, Nebraska, chairman of the U.S. Conference of Catholic Bishops’ Committee on Catholic Education. In his remarks to the bishops, he pointed out that Catholic schools bring about higher levels of student engagement and achievement with 99 percent of students graduating from high school and 87 percent of these graduates attending four-year colleges. He added that according to the National Assessment of Educational Progress, Latino and African-American students who attend a Catholic school are more likely to graduate from high school and college. “Welcoming more children from diverse populations in our Catholic schools and particularly making an effort to reach out to underserved communities, is important for the future of Catholic schools and of our church,” said Bishop Flores. He also said reaching out to families in diverse communities is in keeping with the call of Pope Francis in his apostolic exhortation “Evangelii Gaudium” (“The Joy of the Gospel”). 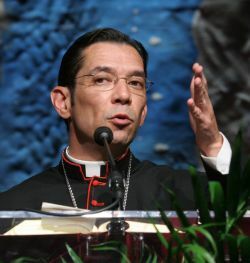 Bishop Flores cited a 2014 Boston College study which found that the larger the number of Latino parishioners, the less likely that parish community had responsibility for a school. It also found that Catholic schools are less available in areas where the Catholic population has grown the most, mostly because of Latinos, in the South and the West. He said major initiatives by bishops, superintendents, pastors and principals to provide consistent cultural competency training and financial investments have produced positive results. For example, he said the percentage of Latino children enrolled in Catholic schools in the United States has grown from 12.8 percent to 15 percent over the past four years. “The needle is moving in the right direction, even if slowly,” the bishop said.